« A classical ECG of “Dead sinus node” and a “Sick AV node” ! During primary PCI , when you encounter severe multivessel disease what will you do ? Surprisingly it is common ! C.Attempt to open and stent all possible lesions. D.Send the patient back to CCU for a conventional thrombolysis or attempt a intracoronary thrombolysis. Answer : All can be a right response depending upon the available expertise , time window, associated complication and hemodynamic stability etc . * Please note ,the most tight lesion may not be the culprit artery. Though there is high chance for that being the culprit , it can be very deceiving especially when there is multi-vessel CAD with chaotic collaterals. The site of lesion and site of infarct can unimaginably remote. (A traffic snarl at remote flyover can have its impact right on the busy commercial street due to diversions ! ). What will happen if you open a non culprit artery first mistaking it for a culprit ? This could lead to dangerous turn of events as whatever little perfusion the patient was getting through the ill-fated IRA will be challenged by the fresh diversion facilitated by non IRA angioplasty. Extreme caution is required. An energetic interventional cardiologist would vouch for opening all lesions . Only thing , he has to make sure is , the patient also has enough energy to withstand his onslaught. Never non culprit lesion if a patient is stable . 0ur aim is not that.If the patient is in shock or impending LVF one can justify opening few more lesions that improve total muscle function which can be vital. What about fall back on thrombolysis? 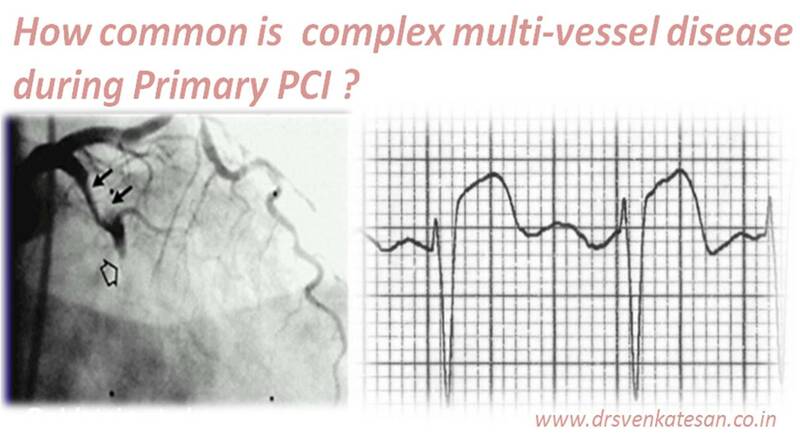 Primary PCI is often made to appear ” As a kids play” by many modern day cardiologists . It is not so. It requires a team effort. It is race against time. Feasibility depends largely on the coronary anatomy. The failure rate of primary PCI is often camouflaged . (Currently Success of pPCI is boasted at 95%) Logically it should include pPCI ineligible anatomy as well . Many still do not understand the real purpose of pPCI. The aim is to salvage the myocardium at risk , sure and fast. 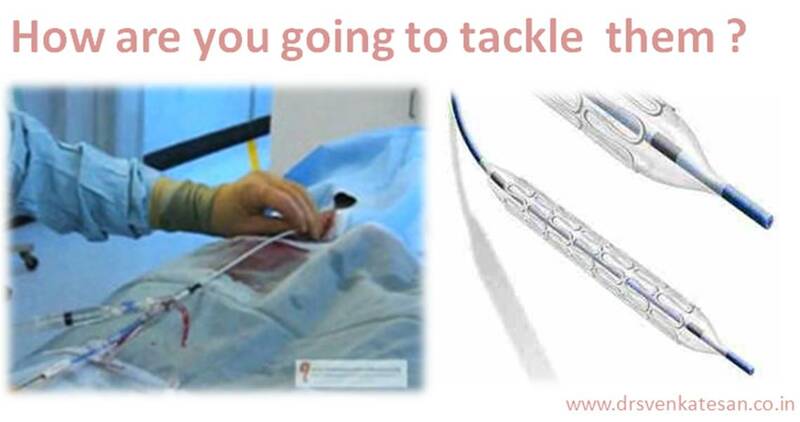 Never attempt for total revascularisation in an emergency situation however tempting it is ! In young persons with discrete single vessel disease the procedure is simple and outcome is straight forward. In elderly , diabetic , STEMI on preexisting CAD, diffuse multivessel disease , complex main left, bifurcation lesions , one requires lot of brain sense to provide optimal outcome . Many times that sense includes abandoning the procedure !